Art Advantage painting cups. 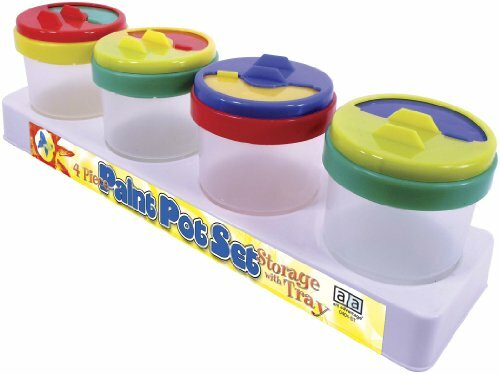 Set includes four brightly colored nonspill cups with a lift off lid that is sized for a children's paint brush. Lid is angled to avoid drips. The secondary lid slides open and closed to allow access or to preserve paint for another day of painting. Comes in a sturdy white plastic storage tray. Speedball Spd-5778 Watercolor Palette, 11-5/8" x 16-1/2" x 1"